The Membership System will be closing for maintenance in 1 minutes. Please finish anything that will involve the membership system, including membership changes or posting of messages. The entire fleet was focused on what was going on below. Few knew that the planet was about to become inhospitable to life and many wondered why their squads had not been sent to the planet with squads they had fought alongside for years. Almost all of them trusted the Warmaster thoroughly. There were those that were expecting what was going to happen next and among them was Captain Gervoth of the Sons of Horus, in command of the Rakshah. He gazed out from his command throne and could see the missiles launch, their warheads tipped with distilled death. He settled back into the seat. He was one of few in the know that was pleased with what was about to happen. Most viewed it as an unfortunate necessity. That about a third of the Legion was about to be destroyed, a fighting force that could be used to better ends than just being exterminated. It was necessary to continue with the plan, but not desirable, they thought. Gervoth was not of that mindset. He saw two open seats in the Mournival. He knew it wouldn't be him filling them, yet, but it meant that other positions would open. When the alarm buzzed at one of the crew stations it drew him from his reverie. He lifted his head, a proximity alert. The crewman whose station it was looked back, "A Stormbird sir. It looks like a World Eater Stormbird." "Should . . . should . . . we fire?" The question was almost absurd, although it brought to Gervoth that the secret of what was about to happen may not have been as well kept as he thought, obviously there was some disquiet among the mortals. "The pattern shows it leaving from planet side." "We did, sir, no response." The situation was unprecedented. In any normal circumstances it would be assumed that the lander had malfunctioning coms, but that was not the most obvious answer here. Gervoth's mind reeled, why is a Stormbird coming up this late and why not head to a World Eater ship. "Do not let it land." "Closing hangar doors 7, 8 and 9"
In moments another alarm sounded to indicate that hangar door 8 had been blown open. Suddenly the bridge was flooded with communications coming from hangar 8 and indicating that a boarding party was storming the ship. Gervoth had moved to look down at the station, his bulk hanging over the railing to stare down at the screen in the pit around the stage of the bridge. As the first few words came through he was moving towards the door, his lightning claws were making a musical tingling as each digit moved against the next in his motion. All the mortals on the bridge stood to watch him go. 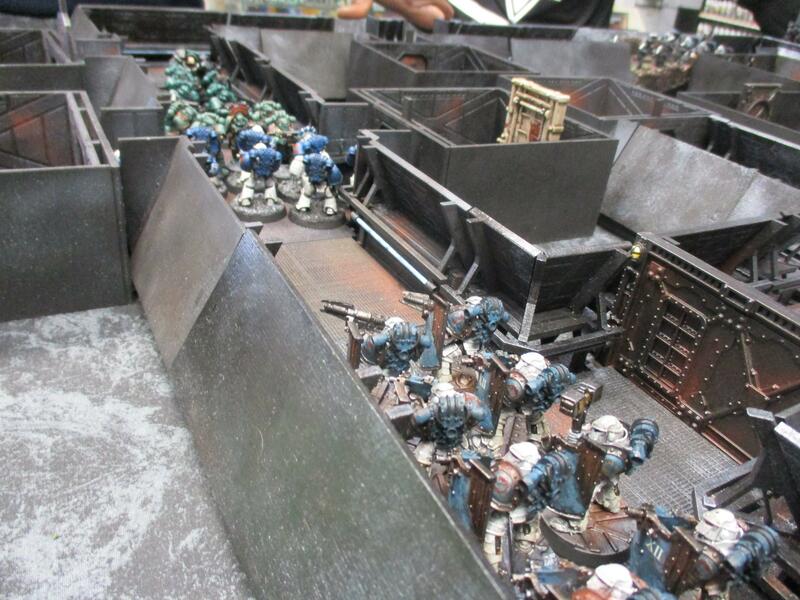 The Captain barked orders over the vox for the Astartes aboard to move to the flight deck and prepare to repel boarders. The instructions seemed ridiculous. 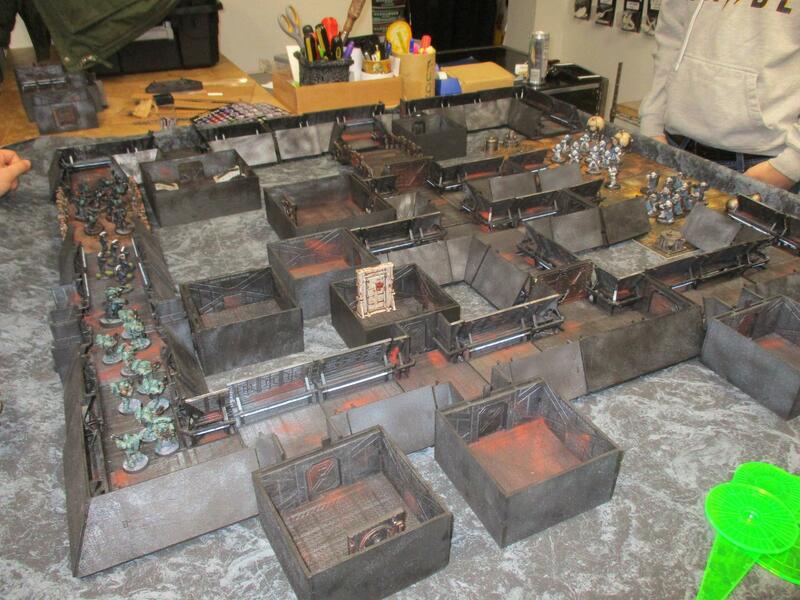 As the lift opened and he emerged into a long corridor accompanied by one squad of Astartes he saw a Reaver squad emerge from a passage to his left. He ordered them to move in the other direction down the corridor and they ran. He followed the squad trying to make it to the hangar before the enemy got further into the ship. "Lock down Hangar 8 doors 2, 3 and 6," he ordered, "that will force them down to the two port-to-starboard main runs." Being part of a legion known for its aggression he had underestimated the World Eaters. Gervoth realized this as the squad ahead of him stopped moving as a door flew open to their right and a warcries of Angron's legion echoed down the corridor. Despite the inherent belligerence of the two legions they felt no deep hatred for each other, and it was difficult for them to regard each other as enemies initially. 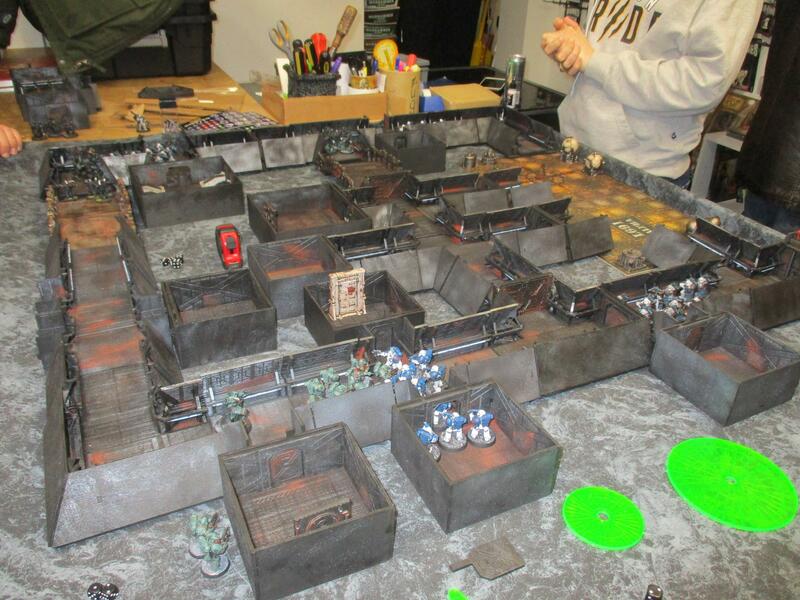 The fighting was desultory and the World Eaters charged into the Sons of Horus after only a short burst of bolter fire. Most of the Astartes on both sides battered at their opponents with the butts of their bolters rather than pulling chainswords and other combat blades. 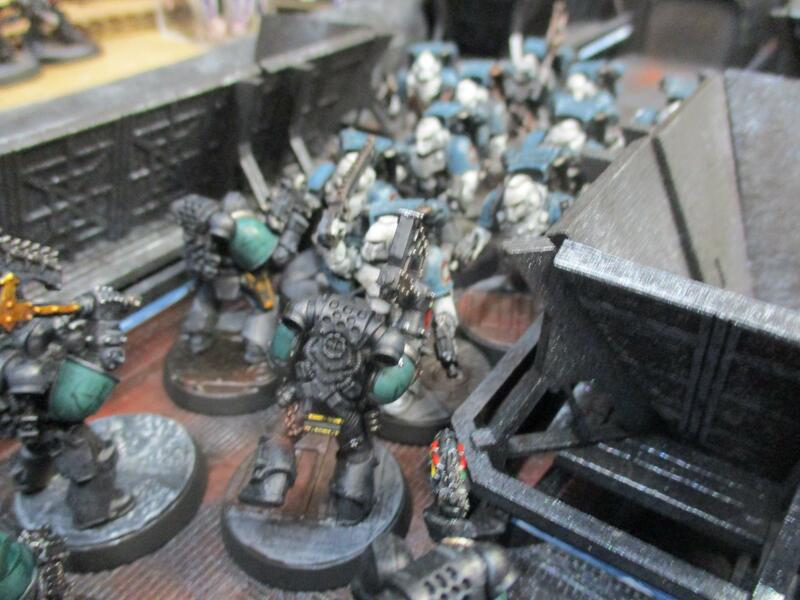 They weren't pulling their blows but even with the full weight of their attack the weapons were not designed to kill a man wearing power armour, much less a space marine. Gervoth stood behind the sea green mass trying to jam its way forward. 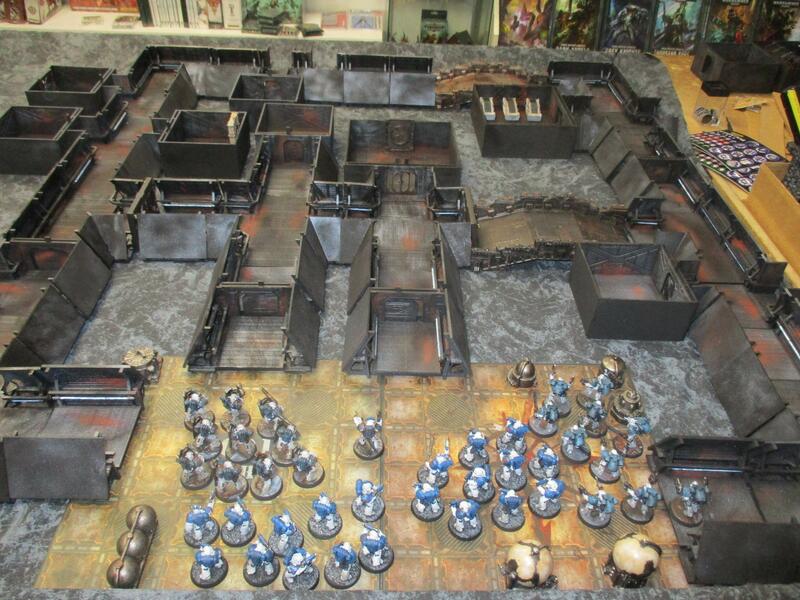 The scrum was a mass of ceramite armour that would not be breached. He looked to the tactical situation and started barking orders to the other groups moving towards the combat zone. 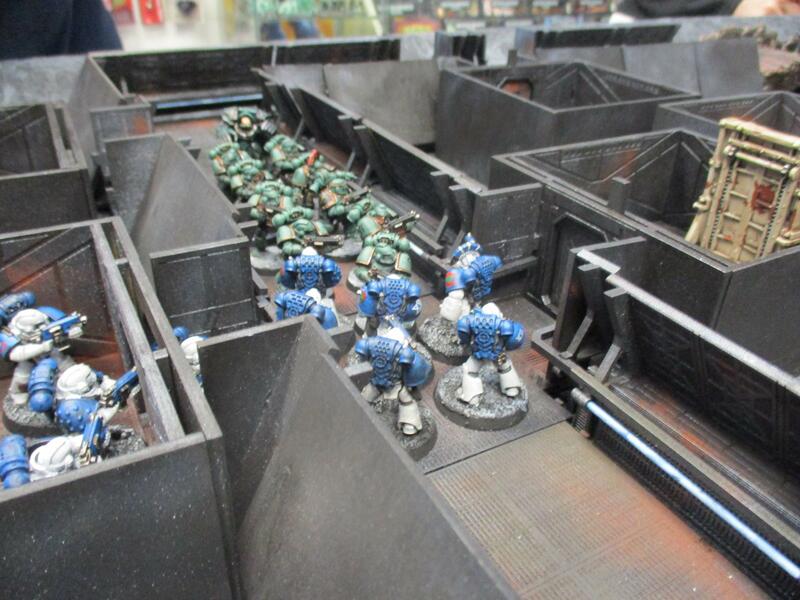 The Reavers he had seen earlier were struggling with a squad of assault marines. 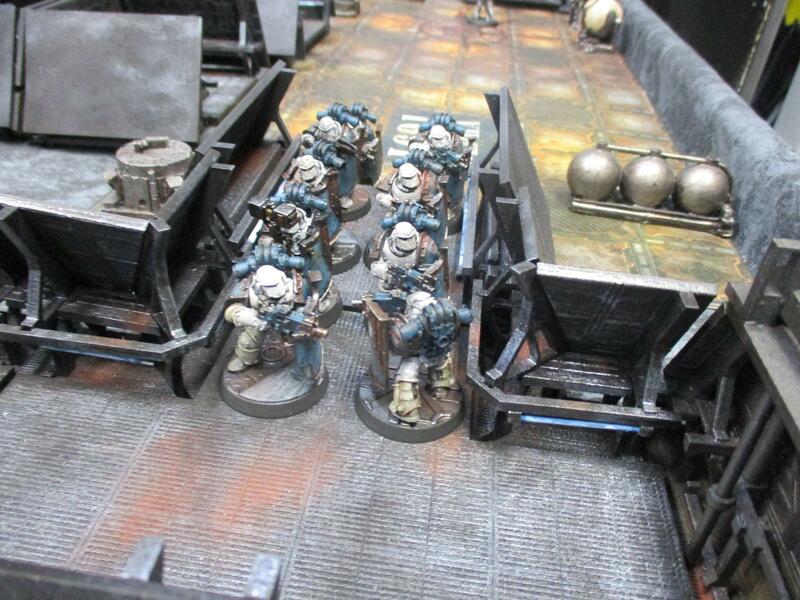 They were wearing jump packs and must have been deployed to the planet below, the cumbersome packs would be of little use to the World Eaters in the confines of ship corridors, even ones designed with Astartes in mind. The fighting quickly turned ferocious and the Reavers were not afraid to murder recent allies. Despite that the realm of close combat belonged more to the 12th legion than any other. 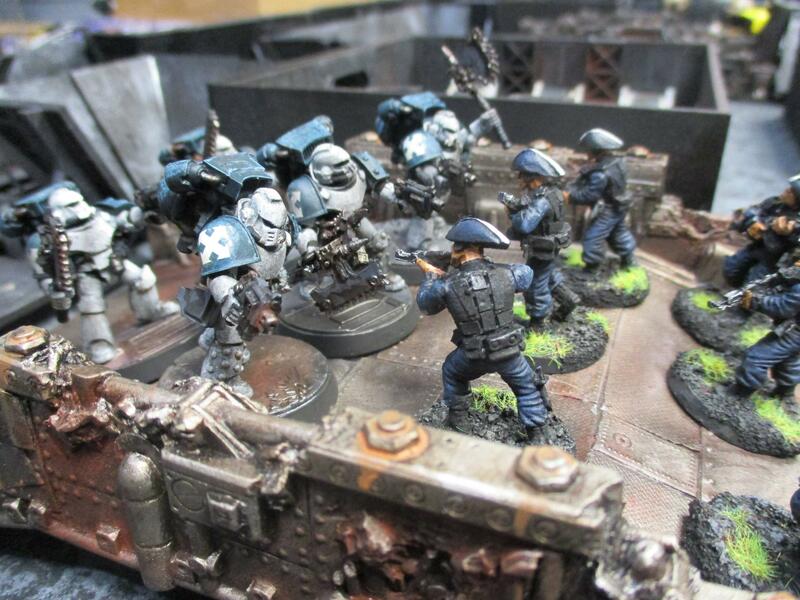 The enhanced aggression of the World Eaters eventually won out and soon the last of the Reavers were cut down in a running battle to get back to their supports. A small gang of voidsmen had answered the summons to try to stop the breach. They bravely stood as they saw the last of the Reavers be battered to the deck by howling assault marines with chain axes. 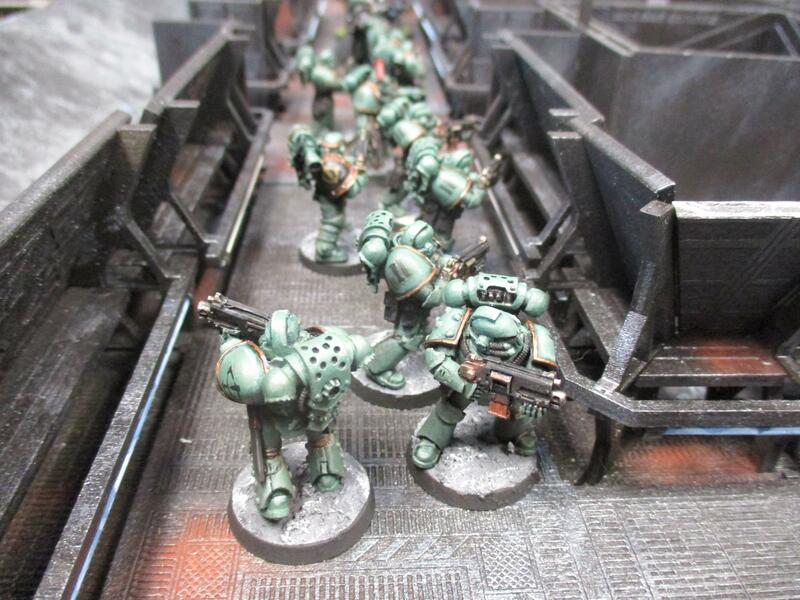 Holding their fire to not hit their masters was a mistake and before a single voidsman could pull a trigger on his lasgun, the World Eaters were firing bolt pistols as they ran towards the mortal ship crew. The hall was instantly splashed red with blood and the view was obscured by a thin red mist that hung lazily in the air. The only two who had survived the brief fusillade ran away from the transhuman warriors. Gervoth got reports from other sections of the ship, it seems that the World Eaters were intent on destroying the ship's life support systems. The first wave had shattered on the breakwater of his marines, but those marines had been critically damaged in the effort. He called his men back. It would allow the World Eaters to regroup but it would also mean that he could redeploy to guard the strategic areas of the ship. Well written and exciting. Thanks for posting. Glad you liked it. I put up reports for the other two games as well. Awesome man! What models are those regular dudes?